Glow in the Dark Parties are rapidly growing in popularity! With the abundance of glow in the dark party products available and a rapidly growing world of creative ideas, you can throw your own, memorable, Glow Party! People are using many different names for these theme parties. Whether you call it a Glow Parties, Black Light Parties or Neon Party, this article will help you think through everything. So whether you are planning a children’s birthday party or a coed bash planning to go wild, get ready to make your glow in the dark parties unique and fun! Before you start buying stuff, it’s important to get a game plan for the party. If you want the theme to simply be “Neon” or “Glow” then you are set and the sky is the limit for being creative. With a little creativity, virtually any theme can be transformed into a glow party! If this is a birthday party for your child, they may have a favorite TV character, TV show, movie, or toy. Don’t let that deter you as there are plenty of creative ideas to go with even the most specific theme. You can throw your party at home or a rented or borrowed space. Having your party at home obviously gives you access to do what you want without special permission. Using your owns space may limit your available space. Knowing these things ahead of time can prevent any party stoppers such as outlets that won’t power your black lights! Of course, for a glow party to work, you will need to find a room you can make as dark as possible. There are obvious safety considerations when doing this, especially if you are planning a kids party. Be sure it is a room that is free of clutter and has plenty of open space. The darker you can make the room, the better. Basements make the best location because there is often less light control you need to do. If you are having your party during the day, and there are windows in the party space, you may have windows you need to black out. Even the best curtains and shades will let in too much light. Pitch black is what your shooting for. You need to consider how much you want to invest here. If you are doing a one-time party, don’t spend too much money. Cut some scrap cardboard to fit your window spaces. If you’d like to go a little fancier, you can use butcher paper or something like . Purchase a role and cut it to fit. A party with a lot of people in a dark small space can lead to mishaps or injuries – especially kids who’ve had birthday cake and are sugared up! Be sure to clear your room of any unnecessary furniture or clutter that may cause someone to trip or bang a body part into. Being in a dark room with only a few glowing points for visual reference can be disorienting. One of the easiest ways to keep your room safe is by using Gaffer Tape that shows up under the black light. This can be used to create guides to your entrances, bring attention to steps leading up or down, or even mark off the dance floor boundaries on the carpet. For larger jobs, there are an assortment of to use for similar purposes. Tape can be used for safety or creatively for your decorations! Your glow party decor is an integral part of the glow party experience! You will want to think about table decorations, wall and ceiling decorations, and even means to decorate your guests! Much of the traditional party decorations will illuminate in the black light. Streamers, balloons, and themed decor purchased at your local party store will have a unique look. But you don’t have to stick to classic party decor – Creative ideas abound. There are a number of you can purchase that are ready to use. You can also use glow sticks or glow bracelets to add to the tables, or place inside things. A popular glow party trick is to place glow sticks inside balloons. Or you can get creative with paints, markers, streamers, posters, and more. While much of your party will be full of things that actually emit their own light, will be essential for your party! Black lights come in all shapes and sizes so you’ll need to consider where in your room you can place the light and how much black light illumination you’ll need. It may be adequate to purchase black light bulbs to place in fixtures you already have. Depending on your space, you may need multiple lights. Your party may indeed exclusively be a dance party. In fact, many glow parties for young adults involve mostly dancing. Choose music your guests will enjoy. Hook up your stereo and bring a set list your guests will enjoy. Techno, Rave and other Electronic genre music will be the most appropriate for a neon party. If this is not in your repertoire, look for some “greatest hits” CDs at your local library, borrow music from a friend, or check out one of many free radio or user created playlists with your smart phone or internet. If your guests are doing a lot of dancing, spinning and jumping, be sure to have a wide and clear dance floor. Keep clear table corners or tripping hazards on the floor. There’s no reason your food table can’t join the illumination party. There are countless recipes that will be fun and delicious at your party. Remember, anything with white or neon colors will work. Chocolate cupcakes with white icing, jello, a sweet tarts and other candy. There are hundreds of options. Decorating your food table will help make snack time even more electric. Place your table, if possible, under a black light. Use splattered neon paint on a black table cloth to underscore your food table. There are dozens of great recipes for food. Get the creative juices flowing with these ideas. Your guests may enjoy creating some neon crafts such as decorating black shirts with puffy paint, signing their name on a black wall, or combine food and a craft by decorating chocolate cupcakes with white frosting and neon icing. Create masks out of UV-Reactive Paper, gaffer tape, and other common craft supplies. There are hundreds of ideas if you put on your thinking cap. There are 2 categories of glow in the dark goodies for your party. There is stuff that glows on it’s own (glow sticks, light wands, glow paint, etc) and stuff that is ultra violet reactive – or that glows under black lights. In both categories, there are endless possibilities for your party! You will need items for games, activities, decorations, gift bags, prizes, and more! Wands, fiber optic gifts, glow sticks, bracelets and more – there are plenty of options for prizes, freebies, and gifts for goodie bags to send home with your guests. Once your party is pretty well planned out, you are ready to design your invitations. 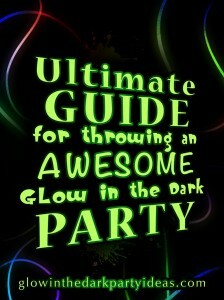 The fundamental design concept for a glow in the dark party is neon or florescent colors on black background. For shorter invitation lists, handmade invites are possible. This is a great way to include your own children in the planning stages. For added fun, write secret messages on the invitations with invisible ink pens. Then require guests to show their exclusive invitations for entry into the party. Upon arrival, guests must flash their invitations under a black light revealing a secret message. Give these pens out as party favors for after-party fun! You may want to send your guests home with parting gifts. Prepare a festive table under one of your black lights full of fun goodies and treats for your guests to take home with them. Include unused glow sticks and treats for after-party fun. When the party is over, it’ll be time to clean up. Make sure you have a storage bin to collect all your supplies. You may want 2 bins – one to save reusable decorations and black lights and another one for leftover goodies. You’ll want to save your party supplies for next time. If you don’t plan on having a glow party again, pack up your supplies and post an ad on Craig’s list or Ebay to recoup a little of the cost. Of course, the aim of the game is to have fun! If you have a limited budget, don’t sweat it. 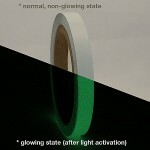 As you can see there are a lot of inexpensive and DIY options for a glow in the dark party. The key is planning ahead, researching ideas online, and give yourself ample time for preparation and setup. Get your friends or your kids on it and share the fun! I am planning on doing this and it will be amazing!! !